Flying with a service dog or emotional support animal (ESA) for the first time can be very anxiety producing, but in reality, the experience is actually easy and low-stress for the prepared handler. It is a very good idea to contact the airlines and/or consult their website a week or more before the flight (or at the time tickets are purchased) to find out what the requirements are for flying with a service dog or ESA. Most airlines now require advance notification and some, like Frontier Airlines, Midwest Airlines, United Airlines, and American Airlines require a special verification form to be completed. 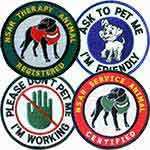 At the airport and on the plane, the animal should wear a solid color vest (NSAR recommends red or green, although there is no standard color. 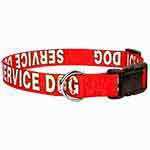 Click here to view), service dog or ESA patches, and a photo ID clipped to the leash, vest, or carrier. All airlines strongly encourage this because it makes identifying your dog as a service dog or ESA much easier and will prevent unnecessary confrontations (this is also true for all other settings in which you may be accompanied by your dog). 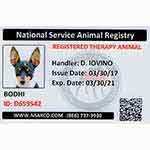 NSAR customers report that all USA domestic airlines now recommend National Service Animal Registry for these items. When you arrive at the ticket or baggage check-in counter, make sure the airline representative is aware that you are being accompanied by a service dog/ESA. Airline personnel have typically seen and managed many passengers with service dogs and ESAs, and have a specific process they must follow before a passenger with a service dog or ESA can proceed without delays. 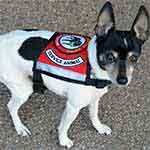 First, you'll be asked questions to determine if the animal is a working service dog or an ESA. If the animal is a working service dog, the airline representative will ask what task your dog is trained to perform for you because of your disability. You, as the passenger, must be able to provide credible verbal evidence at this point (that means you need to be prepared to convincingly tell airport personnel what task your dog performs specific to your disability. We can assist you with appropriate verbiage once you have registered with NSAR). 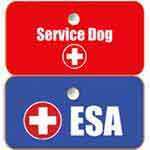 If the animal is an emotional support animal (ESA), then you must tell the airline representative that the dog is an ESA. You will be required to produce a formal letter of prescription for a service dog or ESA from a licensed mental health professional. A letter from your medical doctor will sometimes be accepted, although a properly written letter by a licensed mental health professional (psychiatrist, psychologist, therapist, counselor, social worker) will always be accepted. There is no way around this. In MOST cases, the airlines will want to see this letter in advance of your flight to verify that it is in order. This is designed to save you embarrassment, delays, and money. Click here to find out more about a letter of prescription. Some airlines (Frontier Airlines, Midwest Airlines, United Airlines, and American Airlines, for example) actually require you to have your therapist or licensed mental health professional complete one of their third party verification forms. If you don't have a therapist who will write this prescription letter, click here to get one. Once you're on your way to the boarding gate, the next step is to pass through the security checkpoint. 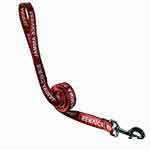 This is easy, and your dog may walk or be carried through the scanner with you, but the dog's leash, collar, vest, or anything else with metal in or on it must be removed prior to going through. Once through, the dog can get dressed again and you'll be on your way to the gate. The Transportation Security Administration (TSA) officer may also ask about your dog, but it's just a formality. Be prepared to explain what the dog is trained to do for you, as a service dog (or quietly explain it is an ESA). Having arrived at the boarding gate, it's a good idea to let the attending airline personnel know that you are being accompanied by your service dog or ESA, although it isn't required. Often, they will allow you to board first and be seated ahead of other passengers out of convenience for you, as well as other passengers. 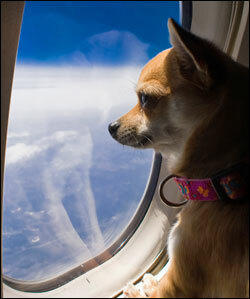 Once you have boarded the aircraft, most airline practices state that your dog (or other animal in a carrier) must be on the floor between your knees and the seat in front of you. 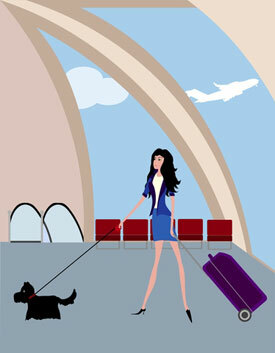 Most of the time, however, flight attendants rarely seem to mind if small a service dog or ESA sits on your lap.